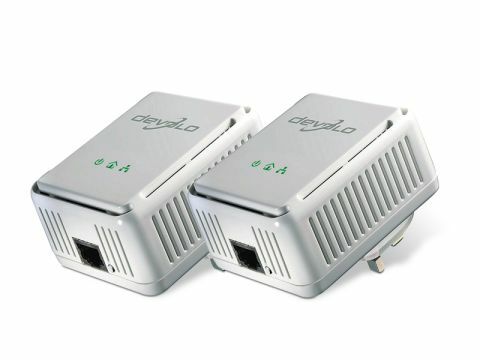 The Devolo dLAN 200 AVeasy starter kit consists of twin Powerline adapters, two Ethernet cables and all the relevant documentation. The full price of this set may make it one of the most expensive solutions, but a quick search online found prices vary considerably. The best price we found was £80 (inc. VAT), so it's worth shopping around. Rather like the D-Link DHP-303, Devolo has gone for a design that makes the Powerline look like a domestic thermostat, so it won't look too out of place in the average home. The white plastic has a glossy finish, with a grill effect on the sides, while the front of the unit sports the Devolo logo and three cut-out LED lights. The single Ethernet port is located on the base of the unit, along with a rather unassuming Encryption key. The device is set with encryption running by default, so pressing this button changes the security key. As with most of the other kits we have tested recently, simply press the button and wait for the green light to flash before repeating on the second adapter. The supplied software allows you to better manage the encryption level of your network. However, it also comes with a couple of useful utilities for better network management. For instance, the Informer lets you keep tabs on which devices are connected to the network, while the EasyShare tools make moving large files around the network easier to manage. When it comes to using the Devolo, we found this to be an incredibly fast and resourceful solution. While it lacks features like the D-Link QoS engine for specifying bandwidth to set tasks, we found that streaming HD content and even using it to hook up a games console online offered good, and more importantly constant, throughput speeds. The dLAN 200 AVeasy may not be the best-known brand available, but it is still a great solution that offers speed and ease-of-use, and all in an unassuming design.